Even for native New Yorkers who are rarely surprised by the secrets offered up by their fascinating home, the hidden NYC that Alex MacLean captured might be something completely new. And if you have never lived in New York, you are sure to be blown away. The architect turned pilot turned photographer took to the skies in a helicopter to capture a world that very few ever get to see: the rooftop outdoor spaces that bring some urban dwellers right into suburbia. Flipping through the pages of MacLean’s Up On the Roof (a copy of which was provided to WebUrbanist by the publisher), all of the trappings of suburban life are evident. The barbecues, picnic tables, gardens and swimming pools call to mind neighborhood backyard parties – only these are no backyards. These are the tops of tall buildings right in the middle of one of the most vibrant cities in the world. MacLean became aware of this secret world almost by chance. An intriguing image he saw on Google Earth inspired the pilot to take a swing over Manhattan while out on a photography assignment. The initial reason for the detour was quickly forgotten when MacLean began to notice an entirely unexpected layer to the city far above the sidewalks. 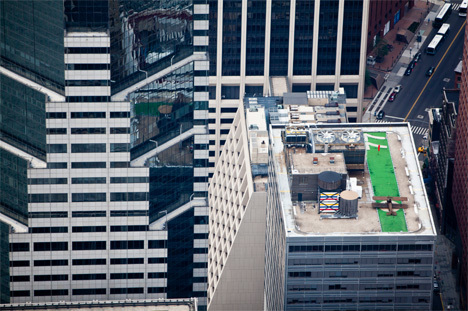 From then on, he began documenting those amazing rooftop spaces. 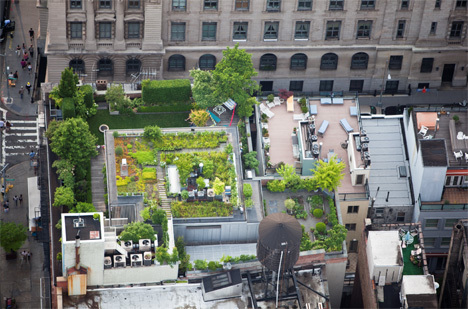 Just like suburban backyards, the roof spaces run the range from sparse and minimal to flawlessly manicured to absolutely chaotic. It is wonderfully mesmerizing to examine each page, leaning in close so as not to miss a single detail. 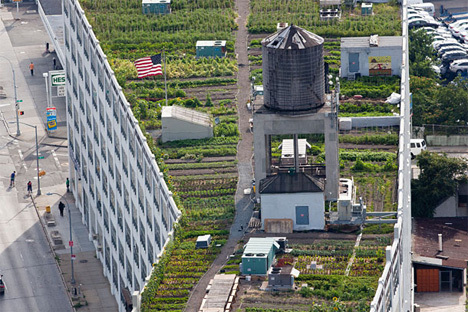 These high-up spaces have been used for everything from playgrounds to restaurants to art exhibits to fully-functional urban farms and even golf courses. In one bizarre case, a replica of a World War I British fighter plane sits on a rooftop runway. 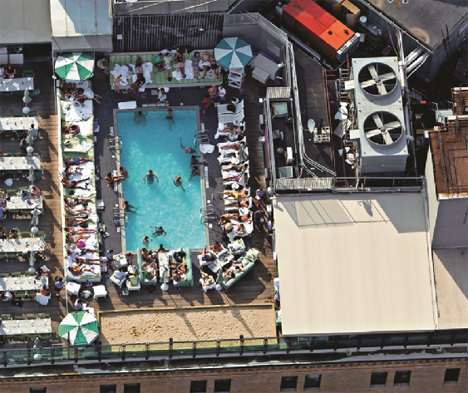 While many of the older buildings sport retro-fit rooftop spaces – added on many years after the buildings were constructed – some new buildings have rooftop living and recreational spaces built in. MacLean notes a particular new building in Williamsburg on which the roof space is segmented into many individual outdoor areas, to be sold later at a premium to residents. 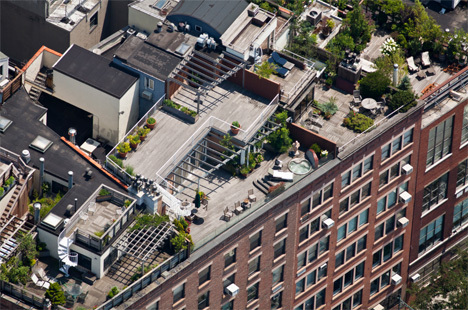 The nearly 200 rooftops detailed in MacLean’s book are perfect examples of urban adaptivity. Even urbanites who wouldn’t dream of leaving the city crave an outdoor space in which to relax. 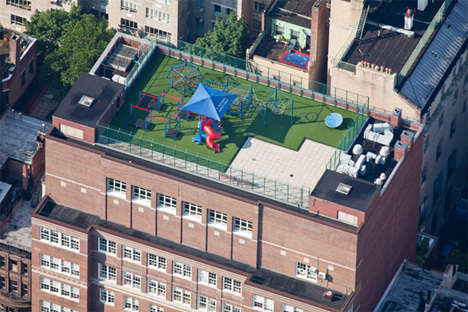 Since rooftops account for one third of all impermeable surfaces in New York City, it only makes sense to put all of that space to use. 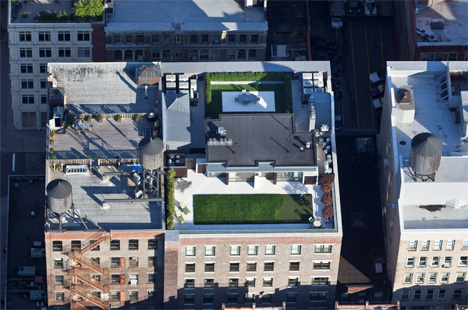 It is interesting to note that, since rooftops have typically been used to house industrial objects like water towers, compressors, and ducts, these things now have to coexist with the rooftop living spaces. In some cases the solutions are remarkably elegant, such as enclosures that camouflage all of the mechanical things. In others, the spaces meant for people simply wind their way around the inconvenient objects. MacLean’s engrossing book can be enjoyed simply for its beautiful photography and glimpses into ordinarily-inaccessible places. But for urban enthusiasts, it also inspires a sort of giddy excitement over future possibilities. 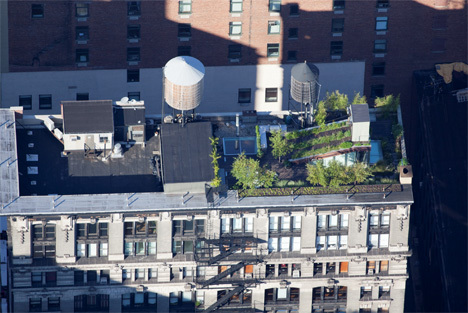 As more and more of the world’s population settles in densely-populated urban areas, more cities will start to resemble New York…and more urbanites will head to the roof for their daily dose of nature.